I just finished reading Harry Potter and the Half-Blood Prince. I think it was my favorite one so far. I started reading the Harry Potter books when I was working at the Dallas Theater Center as an intern. During the first show of the season, Hedda Gabler, I was assigned to run sound. If you are familiar with Hedda then you know it's about 3 hours long. Don't get me wrong, it was a wonderful performance of a classic, but seeing the play 50 times and only having about 20 cues during that 3 hrs., gave me ample time to ponder the complexities of Hedda's psyche. So I spent the time reading. I read whatever I could get my hands on, including a Vanity Fair magazine that had Annie Leibovitz photos of the first Harry Potter characters. Of course, I hadn't read any of the books and therefore didn't know who any of the people on the pages were, but I was intrigued. The primary reason that I was had a copy of VF in the first place was because a few of the other stage hands were ga-ga over the books and were going on about the pictures in the magazine. So I asked one of them if I could borrow a copy of the first one to read. It turns out at least one copy of each of the four books that were written at the time were floating around the theatre and I was able to read the first three in the matter of two weeks, and finished the fourth the night that the show closed. I remember trying desperately to finish the last chapter of The Goblet of Fire before my boss got me to working on striking the set. Needless to say I thoroughly enjoyed the books and when the fifth came out I had my reserved copy. My wife and I are both fans, actually, so we bought two copies so that we could read it at the same time (something that would have served us well to do this time and solved more than a little dispute over the book). But something always bothered me about the books. No, it's not the writing or story points or plot twists. It's not even the fact that the first two books are rather elementary and rely heavily on a deus ex machina to resolve the story tightly in the end. After all the books are intended for youth, especially the first two. No, my disagreement was with the sport of choice for the wizard and witching world: Quidditch. 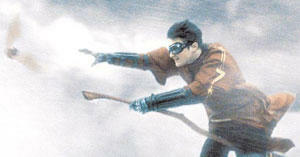 The first time I heard of Quidditch I was very interested. I am a huge sports fan and the idea of something that resembled basketball on broomsticks sounded like a lot of fun. I could just imagine myself flying through the air with the quaffle dodging opponents and finally working the Keeper so that he think I'm about to toss the ball in to one of the hoops but actually go for the other. The moment I started reading about it I was very careful to take in each detail, I wanted to imagine what this fascinating would really look like. The idea that something is made up and couldn't actually happen and therefore it is ridiculous to imagine it so is about the most detrimental think a person can think of when dealing with fantasy. Fantasy is all about putting yourself into this world, and believing, if only for the time you are reading that everything contained within the pages of the book are true. For this reason, I wanted to fully believe the world of magic and wizards and Hogwarts and Quidditch. The first book introduced the world to this sport played on broomsticks on a pitch (oval, roughly the size of a football field) in which two teams see who can score the most points. Points are scored by sending the quaffle (a magical ball) through three hoops on either side of the pitch each hoop worth a different number of points. The game seemed simple enough, almost like basketball or soccer. The addition of two team members whose job it is to send a second enchanted ball, the bludger, batted at various opponents with the intention of disorienting them, and at times knocking them clean off of their broomsticks, seemed a little unnecessary for game that already took skill and dexterity to play, but I bought into it. The problem with me arose with how the game of Quidditch is ended. There is a third ball, called the Snitch, which has wings, is golden and smaller, and about the size of tennis ball while the others are closer to a volleyball. This elusive little ball flies around the pitch the entire game hiding and ducking and evading capture by the player known as the Seeker. The Seekers job is to fly around the pitch, find the Snitch, and catch it. (Here comes my big argument) Once the Snitch is caught the game is over and the team whose Seeker catches the it first receives 150 points. Now, granted, sending the quaffle through the hoops, (which have a more official name that escapes me) can rack up the point, being that they are worth 20, 30, and higher numbers like that (click on the title of this entry for complete rules). But it seems to me that in a supposed team game, there are really two separate games taking place: the game called Quidditch and the game called Find the Snitch. It is up to the Seeker and the Seeker alone to win the game for their team by finding and catching the Snitch. As a Keeper, your only real job is to make sure that your team doesn't fall behind by more than 150 points because no matter how well you've done, the Seeker will win or lose the game for you in the end and all of your sweat and effort has accounted for little or nothing. I could think of no other sport, in the real world, were one team member's actions and performance had as little bearing on whether the game was won or lost. And so it goes, every time Quidditch is played in Harry Potter's world this issue becomes a problem because one team will be fast ahead but lose because the other team's Seeker was faster or more agile or just lucked out and caught the Snitch. I wonder if this is a problem that J.K. Rowling either didn't foresee, or simply didn't think mattered or has even noticed. I kind of imagine her sitting down writing the second and third books and kicking herself because she essentially wrote herself into a corner. She obviously can't change the nature of a game that has been played in the magic world for centuries, not to mention that the outcome of these games very rarely if ever deal directly with the primary plot. But, if it were me I'd be a little agitated that the rules of a game that would never work in real life (flying brooms notwithstanding) and would have had these kinks dealt with throughout the years by the natural process of being played, is now sealed within the billions of pages in circulation, not to mention the minds of every dorky little eighth grader in the world. My issued with Quidditch by no means diminish my love for the books themselves. They are obviously very imaginative and exciting and have spurred millions of children to read who might not have otherwise. I especially enjoyed the way that Alfonso Cuarón imagined the game in the most recent movie adaptation of The Prisoner of Azkaban. Soon enough I was able to get pasted and it would simply take me out of the world for a moment while reading, if that. I know that there are some obsessive people with regard to Harry Potter and they would be quite upset to hear my objections to a game that my sister-in-law Amy believes is the only game worth playing, but its a small thing that I can easily get over. But, I am interested to hear if any other Harry Potter fans havefeltt the same way. It's okay, you can come out, too. Nobody's gonna hurt ya. I've always felt that the Quidditch parts were somewhat boring and took up too much time. Possibly because I'm not a sports fan. But anyway, I've heard that J.K. Rowling didn't enjoy writing the Quidditch parts because there was only so much you could do with them, and there won't be any Quidditch in the next/last book. And I completely agree about the game itself. It's like, "The Mavs are up by 130 points. There's no way the other team could....Oh wait! Shaquielle O'Neal has found the magic bowling ball hidden under the rafters! The Miami Heat win 150 to 130!" I'm going to e-mail you my Snape theory. I too have had the exact problems with Quidditch, plus, I don't think the chapters where it's played are particularly interesting, mainly because they rarely deal with the main plot, as you said. In all fairness, though, it is not that uncommon for the team that catches the snitch to lose. The example that comes to mind is in Goblet of Fire during the World Cup when Viktor Krum catches the snitch but Bulgaria loses to Ireland. I'm sure there are examples from Hogwarts as well, but I can't think of them now. We can, however, be thankful that Quidditch WILL NOT appear in Book 7. According to this interview, Rowling really got tired of writing Quidditch scenes (you may be right about her painting herself into a corner). I must say, though, with everything happening in HBP, why did you choose QUIDDITCH to blog about? So that's why I don't like Quidditch! It's like a Hollywood blockbuster: a solo bit masquerading as a team game. Thanks, Kyle, for extracting that opinion from the dark corners my psyche. Next time, though, stay out of the hall closet. I had the same problem. The math is just too weird. Eliminate everything in the game but the two seekers and the snitch and it's still the same game. Since I'd never heard this complaint before I thought that I was alone. I glad to hear that I'm not. Perhaps everyone else just is better at living in reality and caring that much about it. To Jason: I'd like to spend more time digesting the story of The HBP before really commenting on it. Plus this was a solid thought that I had something to say about. Plus there's the issue with spoilers and all that. Quidditch is just what was on my mind I guess. JD thanks for the email about Snape thoery. I'm in Abilene at my in-laws but as soon as I get back to my email, I'll get back to you. I will say that I don't think that I agree with you 100%. I do agree that HP is, himself, what you said he. I had thought that from the first time they mentioned horcruxes and explained what they were. All this dodging spoilers is tiring, I HEREBY DECLARE THIS COMMENT LINK A SPOILER AREA! 1. I believe Snape was acting on Dumbledore's orders to kill him. This will be EXTREMELY difficult for Harry to accept in Book 7, but eventually he will have to. 2. I believe Draco will join forces with Harry at some point in Book 7 to find the Horcruxes and defeat Voldemort. You could see throughout HBP that he didn't like what he had gotten into. 3. I want to say that R.A.B. is Regulas Black, Sirius's Death Eater brother thought to be long since dead, but that explanation seems too obvious. But the locket that couldn't be opened in the House of Black mentioned in Order of the Phoenix seems ominous. 4. I DO NOT think, as others do, that Harry is himself a Horcrux because (a) I don't think Voldemort would make his arch enemy a Horcrux, (b) Voldemort was trying to KILL Harry. After that attempt failed, he would have had no ability to make Harry a Horcrux, (c) the scar alone would not likely be the source of the Horcrux, (d) I don't think JK Rowling would kill her hero, which would almost have to happen if Harry is a Horcrux. She has said that this is not a Christian allegory; killing Harry to save the wizarding world would be too close to that. The main reason that I think harry might be a horcrux is because of the connection he has with Voldemort. They even said in previous books that Vol and Harry exchanged parts of themselves when he was a baby. I I do see your point about Jo needing to keep her main hero alive. I can't imagine that Snape is anything but evil and acting on Dumbledore's orders. The book said that it was the only time that Dumbledore had ever pleaded with someone and seemed so frightened even almost pleading with Snape. Plus, Snape made the unbreakable oath with Narcissa Malfoy at the beginning meaning that he knew he might have to kill Dumbledore or die himself if he allowed Draco to be harmed in his attempts to kill Dumbledore. I had thought from the beginning that Narcissa and Draco might turn to the good side when she was pleading with Snape. I hope so at least. Regulas Black does seem obvious and you'd think that Hermione would have thought of it. We'll just see. Yes, Harry and Voldemort are connected on a very deep level (i.e. they are part of each other), but that doesn't necessarily mean that Harry is a Horcrux. My understanding was that Horcruxes were created by an intentional dark spell, not simply a freak-of-nature Unforgiveable Curse gone wrong. Also, when I read the chapter where Snape made the deal with Narcissa, it did not seem that Snape knew what they were talking about, referring to "Draco's task". He said he knew the plan, but he was very evasive about that knowledge. I think he entered into the Unbreakable Vow as a way to maintain his role as a double agent, only later realizing what he vowed to do. It stands to reason, then, that he would discuss this with Dumbledore, who then agreed that Snape, rather than Draco, should kill him. That would explain why Dumbledore is so adamant about Harry learning everything about Tom Riddle and why he wants Harry to accompany him to the cave: he knew that he was going to die, and he needed Harry to be ready to go on alone, as he was destined to do anyway. When he pleaded with Snape, I fully believe that he was pleading with Snape to kill him, which Snape would have been reluctant to do, not pleading with Snape to let him live (that would not be like Dumbledore). I don't have the book in front of me, but doesn't it describe a hesitation or "dip of the wand" just before the assassination? Also, you notice that (a) Snape didn't kill Flitwick, he only stunned him, and (b) after killing Dumbledore, he didn't stay to fight, only to get him and Draco out of there. I would think a true Death Eater would have done both. The only problem that I can see with this theory is why would Dumbledore not tell other Order members, especially McGonegall? I would think that he would want at least one or two to know that Snape would have to kill him, and they all were obviously stunned by the news when they heard. One the one hand, this makes sense because a true death eater would have insisted that Draco kill Dumbledore since this was Voldemort's request. What I don't understand is why dumbledore had to die and why Snape and Dumbledore, if they were working together couldn't have or didn't stop Malfoy when they knew what he was up to. Sure they didn't know that he was creating the passage through the cabinets but with Harry's suspicsions and their knowledge and powers couldn't they have found out? They might have been able to find out what Draco was doing, but maybe not. The point, though, is that they eventually knew that he had to kill Dumbledore. This meant that Snape would have to kill Dumbledore because of the Unbreakable Vow. Narcissa made him promise to do the deed if Draco could not. If he hadn't killed him and Draco had failed (he was going to fail, as Draco was not going to be able to kill Dumbledore), then Snape would have died. Kyle, you were saying you didn't know why Snape and Dumbledore couldn't have just stopped Draco instead of Snape having to kill Dumbledore. To me, he seemed extremly weak from the beginning, almost like he wasn't going to last much longer anyways. But why Snape agreed to do it? What if Snape actually made an Unbreakable Vow with Dumbledore years ago when he first came to teach at Hogwarts? That would explain two things, a.) why he killed Dumbledore and b.) Why Dumbledore had believed that he was not evil all along. He could have vowed to be faithful to Dumbledore, but he also vowed to help Draco... so by doing both of these deeds, he escaped his death. I do agree that Dumbledore seemed to be asking Snape to kill him. I do not think that Dumbledore would ever -beg- for his life. Now about Harry being the Horcrux.... I did believe this theory until I read what Jason said. That makes sense. Why would Voldemort make Harry a horcrux if he keeps trying to kill him? I'm going to have to sit and think about this some more now. It is a very interesting theory though. I think R.A.B. is Regulas Black, as well. It does seem obvious but in an interview I read with Jo, the question was asked and her response made you believe that we are right. I don't have the book with me, so I don't remember exactly what the conversation was, but Harry (or someone) once asked Sirius if Regulas was killed by Voldemort personally, and Sirius' response was that he wasn't important enough to be killed personally by Voldemort. But it may be possible that after stealing the Horcrux from the cave, he was killed by the Inferi. But I don't know... because the locket in OotP is mighty suspicious as well. True, Jo doesn't like writing Quidditch scenes (I don't blame her, when she obviously has much more interesting scenes to write)but the 7th book isn't going to have any playing scenes, not because she just doesn't want to write them, but because they are not returning to Hogwarts. But I do have a question for you... the end of HBP didn't make it 100% clear to me, but do you believe Ron and Hermione are going with Harry, or do you think he is going to make him stay? 98% of me believes that they are going with him... but I always imagine the worse, and that would be pretty sucky to me. I'm really glad you enjoyed the book, it was by far my favorite out of the series as well. Knibb High School Football RULES!!!!!! !